He arrived at a moment that Zhuge Liang was absent on an inspection journey, but the doorkeeper announced him and said he had come to throw in his lot with Liu Bei. He was received, for he was no stranger in name. 77 When Pang Tong was admitted, he made the ordinary salutation but did not make an obeisance and this, coupled with his ugly face, did not please his host. 78 "You have come a long and arduous journey," said Liu Bei. 79 At this point the suitor should have produced his letters from Zhuge Liang and Lu Su, but did not. 80 Instead he replied, "I hear, O Imperial Uncle, that you are welcoming the wise and receiving scholars, wherefore I have come to join your service." 81 "The country is decently peaceful now, and unfortunately there is no office vacant. But away to the northeast there is a small magistracy, Leiyang, which needs a chief. I can offer you that post until there should be something more fitting." 82 Pang Tong thought this rather poor welcome for a person of his talent. But his friend was absent, so he could do nothing but control his annoyance and accept. He took his leave and started. 83 But when he arrived at his post, he paid no attention to business at all. He gave himself up entirely to dissipation. The taxes were not collected nor were lawsuits decided. 84 News of this reaching Liu Bei, who was angry and said, "Here is this stiff-necked pedant throwing my administration into disorder." 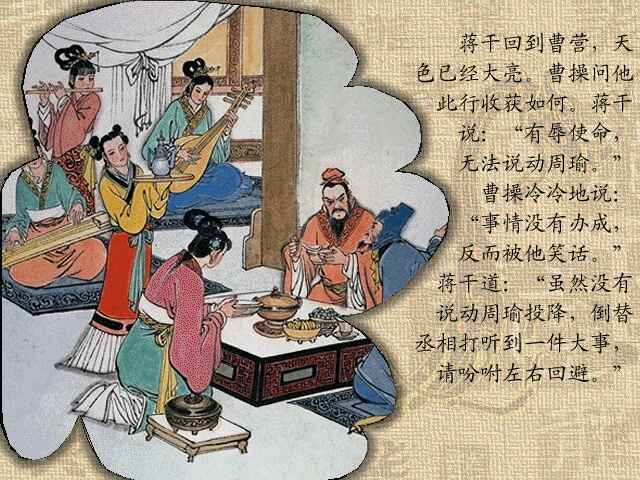 85 So Liu Bei sent Zhang Fei to the county with orders to make a general inspection of the whole county and look into any irregularities and disorders. But as Liu Bei thought there might be some tact needed, Sun Qian was also sent as coadjutor. 86 In due course the inquisitors arrived at Leiyang, where they were received by the officials and welcomed by the people at the boundary. But the Magistrate did not appear. 87 "Where is the Magistrate?" asked Zhang Fei. 88 "Ever since his arrival, a hundred days ago and more, he has attended to no business, but spends his days from morn to night in wine-bobbing and is always intoxicated. Just now he is sleeping off a debauch and is not yet risen." 89 This raised Zhang Fei's choler, and he would have dismissed the offender forthwith had not his colleague said, "Pang Tong is a man of great ability, and it would be wrong to deal with him thus summarily. Let us inquire into it. If he is really so guilty, we will punish his offense." 90 So they went to the magistracy, took their seats in the Hall of Justice, and summoned the Magistrate before them. He came with dress all disordered and still under the influence of wine. 91 "My brother took you for a decent person," said Zhang Fei, angrily, "and sent you here as magistrate. How dare you throw the affairs of the county into disorder?" 92 "Do you think I have done as you say, General?" said Pang Tong. "What affairs have I disordered?" 93 "You have been here over a hundred days and spent the whole time in dissipation. Is not that disorderly?" 94 "Where would be the difficulty in dealing with the business of a trifling county like this? I pray you, General, sit down for a while till I have settled the cases." 95 Thereupon Pang Tong bade the clerks bring in all the arrears and he would settle them at once. So they brought in the piles of papers and ordered the suitors to appear. They came and knelt in the hall while the magistrate, brush in hand, noted this and minuted that, all the while listening to the pleadings. Soon all the difficulties and disputes were adjusted, and never a mistake was made, as the satisfied bows of the people proved. By midday the whole of the cases were disposed of, and the arrears of the hundred days settled and decided. 96 This done, the Magistrate threw aside his pen and turned to the inquisitors, saying, "Where is the disorder? When I can take on Cao Cao and Sun Quan as easily as I can read this paper, what attention from me is needed for the business of this paltry place?" 97 Zhang Fei was astonished at the man's ability, rose from his seat, and crossed over, saying, "You are indeed a marvel, Master. I have not treated you respectfully enough, but now I shall commend you to my brother with all my might." 98 Then Pang Tong drew forth Lu Su's letter and showed it to Zhang Fei. 99 "Why did you not show this to my brother when you first saw him?" asked Zhang Fei. 100 "If I had had a chance, I would have done so. But is it likely that one would just take advantage of a letter of commendation to make a visit?" 101 Zhang Fei turned to his colleague and said, "You just saved a wise man for us." 102 Sun Qian and Zhang Fei left the magistracy and returned to Liu Bei to whom they related what had happened. 103 Liu Bei then seemed to be conscious of his error and said, "I have been wrong. I have behaved unjustly to a learned person." 105 "Pang Tong is not the sort of person to be met with in any day's march. Employ him in some capacity where extra ordinary talent is required, and his powers will declare themselves. Beware of judging him by his looks, or you may lose the advantage of his abilities, and some other will gain him. This would be a misfortune." 106 While Liu Bei was feeling cast down at the mistake he had made, as shown by the letter, they announced the return of Zhuge Liang. 107 Soon Zhuge Liang entered the hall, and the first question he put after the formal salutations was: "Is Directing-Instructor Pang Tong quite well?" 108 "He is in charge of Leiyang," replied Liu Bei, "where he is given to wine and neglects his business." 109 Zhuge Liang laughed, saying, "My friend Pang Tong has extraordinary abilities and ten times my knowledge. I gave him a letter for you, my lord. Did he present it?" 110 "This very day I have received a letter, but from Lu Su. I have had no letter written by you." 111 "When a person of transcendent abilities is sent to a paltry post, he always turns to wine out of simple ennui," said Zhuge Liang. 112 "If it had not been for what my brother said, I should have lost a great scholar," said Liu Bei. 114 "As soon as the Young Phoenix shall arrive, he should be given an important post." 115 Liu Bei rejoiced indeed as he read it, and he said, "Water Mirror said of the two men, Sleeping Dragon and Young Phoenix, that any man who obtained the help of either of them could restore the empire when he would. As I now have them both, surely the Hans will rise again." 116 Then he appointed Pang Tong as Vice Directing Instructor and General, and the two strategists began training the army for its work of subjugation.